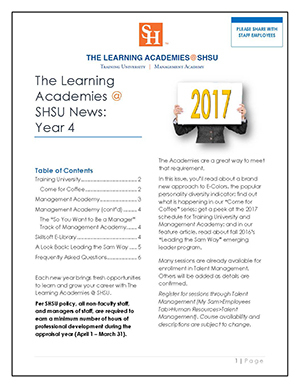 Sam Houston State University offers staff and managers of staff professional development opportunities through The Learning Academies @ SHSU. The Academies, which include Training University, Management Academy, and the Skillsoft E-Learning Library, are the next step toward individual training plans for staff employees. To learn more about the Staff Professional Development Program and The Learning Academies, click on the links below. In 2013, implementation of Talent Management provided both staff and faculty the ability to maintain training transcripts in one centralized location. Talent Management organizes and centrally locates access to the Academies’ curriculum. External training can be recorded in Talent Management, and managers can assign training to their direct reports through the system as well. Once training is complete, users can print out their own certificates of completion for their files. Employees can register for instructor led trainings such as Photoshop, Word, and Banner Finance 101 through Talent Management. In addition, New Hire [New Hire Training Matrix] and compliance training for all employees is administered through Talent Management. Banner General Navigation is now offered online through Talent Management and is available to all employees as a prerequisite to requesting Banner access. Scroll down for links to additional training-related information such as tutorials, a frequently asked questions (FAQ) sheet, and more. You can sign up for trainings by accessing Talent Management, going to the Learning Tab, and clicking on Browse for Training. If you have any questions about IT trainings, please contact IT @ Sam Help Desk: 4-1950. Click on the link above to take your required EEO Training through our Talent Management Learning Management System. State Law (Chapter 21, Section 21, Texas Labor Code) requires that each new state employee take EEO training no later than the 30th day after employment and to follow it with a refresher course every two years.